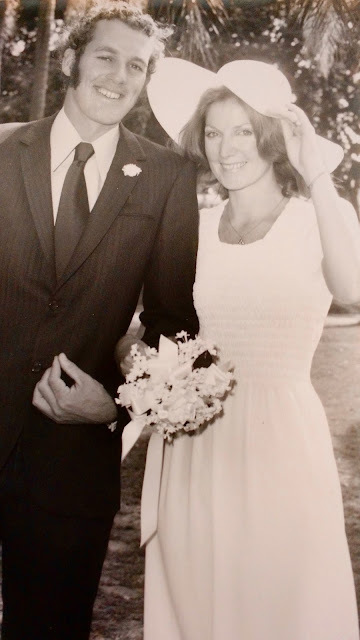 While talking to my friend about the first 60s-style boutique in Brisbane called Splendiferous recently I remembered another friend who bought her gorgeous wedding dress there. As I was the bridesmaid I remember well the day in 1971 when I went with her to buy it. The dress (pictured above) was long, white crepe with a shirred bodice and short sleeves ... so of the era and still looks fabulous especially with her gorgeous Marianne Faithfull style hat. Thank you for letting me use this photo. We all loved Splendiferous in Albert Street, Brisbane opened in the late 60s by sisters Kris Stevens and Bodil Bossey. It was so popular and new for Brisbane with the funky styles, groovy sales assistants and music playing. The owners opened another boutique called Brazilia nearby in Queen Street. If anyone has any memories of either of these boutiques or old photos wearing something they bought there would love to hear from you.